Community recruitment is key. It allows our research team to step outside the laboratory and personally meet community members. 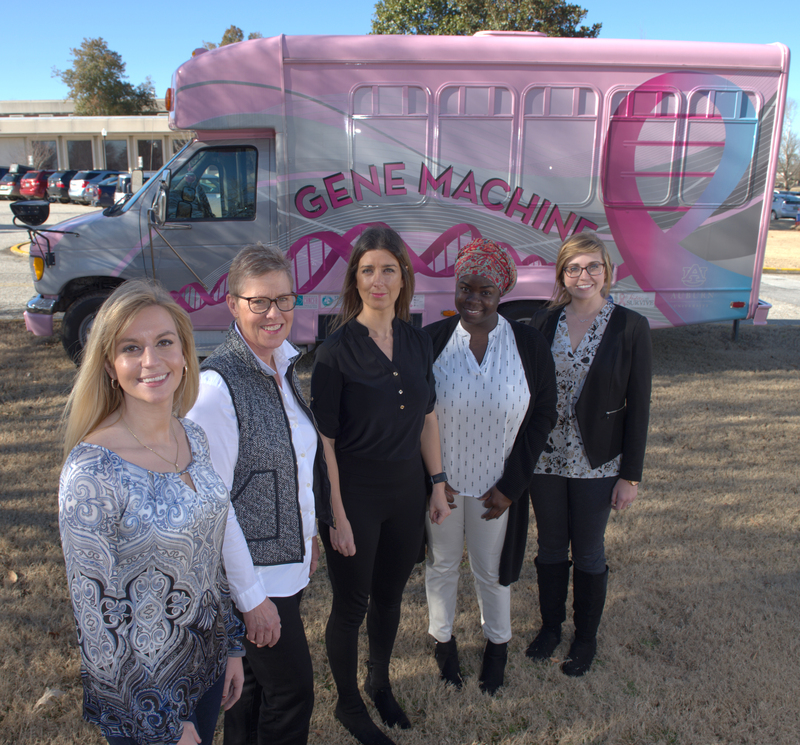 Team members drive a bright pink converted shuttle bus, known as The Gene Machine, around the state for education sessions, community events, and study enrollment appointments. 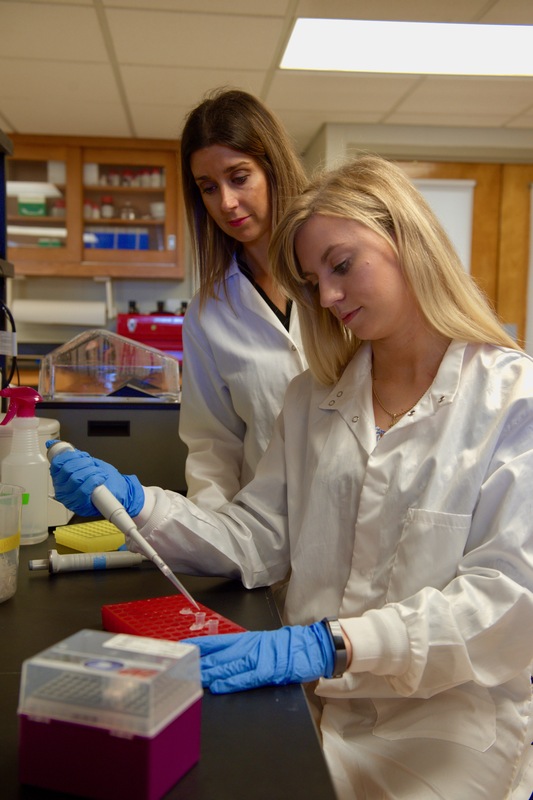 The team enrolls those affected by cancer and their family members to examine cancer genetic mutations. The Gene Machine is a 15-passenger bus that serves as a mobile recruitment and enrollment station. It underwent extensive interior and exterior renovations for this effort. Auburn University Facilities Management staff renovated the interior, which included the installation of laminate floors, curtains, a table, chairs, storage cabinets, two phlebotomy chairs, a refrigerator, and biosafety equipment. A local business designed and installed a wrap for the outside of the bus, which serves to advertise the study. The wrap includes recruitment criteria as well as sponsors and community partner logos. Members of the CBR team must undergo bus safety and defensive driver training to operate The Gene Machine. Click here to visit The Gene Machine page on Facebook. 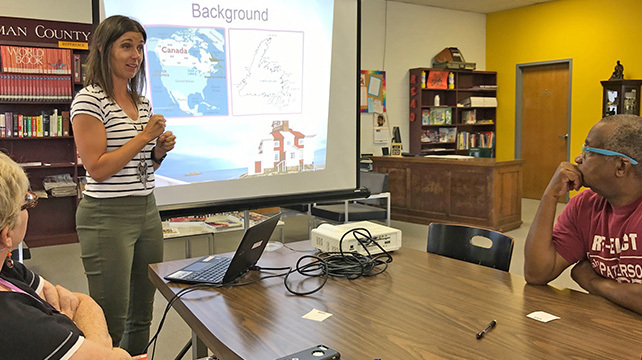 Dr. Merner and her team provide free education sessions about cancer risk factors. The team travels to locations statewide to groups who schedule sessions and want to learn more about cancer risk factors. Their presentation, “Cancer Risk: Do Your Genes Matter?” acknowledges family history and ethnicity as genetic risk factors of cancer. She specifically discusses how genetics can contribute towards risk with a focus on breast, ovarian, and prostate cancers. These sessions are perfect for cancer support groups, church groups, family reunions, etc. If you are interested in booking an education session, click here for our contact information. The Gene Machine team travels to interested individuals who qualify for the cancer genetics research study. – Plus, family members of current study participants. During an enrollment session, that takes about 30 minutes, applicants are guided through study consent forms and provide information about demographics, cancer diagnosis, and family history. A blood sample is collected for DNA, which is stored in a bio bank and used for genetic analysis. If a blood sample is not possible, a saliva sample can be taken. During the consent process, you can request to receive confidential gene screening results regarding clinically manageable mutations. If you are interested in becoming a study participant, click here for our contact information. The first cancer-affected participant from each family is screened for a panel of more than 50 genes that are known to or thought to increase the risk of breast, ovarian, and prostate cancer, including BRCA1 and BRCA2. If a mutation is detected, participating family members are screened for the mutation. Ultimately, this screening determines the individuals in the study who have inherited mutations in known cancer genes and identifies participants who need additional screening. Individuals/families who do not have mutations in known cancer genes will be studied to find new cancer genes. Resulting discoveries can help better assess genetic risk and gain a more clear understanding of the driving forces of cancer, which can aid in the development of enhanced disease management strategies, including personalized drug therapies.